Sunbird AZ Real Estate in Chandler Arizona is in demand! Sunbird AZ real estate is sizzling hot along with the rising Arizona temperatures. Sunbird in Chandler, designed by Robson Communities, is a less-expensive option to their nearby, Sun Lakes Community. You can select from a variety of floor plans in both single-family and manufactured-home styles. Enjoy an intimate feel in this gated retirement community that offers only 1,631 homes and resort amenities. Sunbird is located near the base of the San Tan Mountains and is situated within 15 miles to theaters, restaurants, casinos, museums, and shopping. The Chandler Fashion Center Mall and San Tan Shopping Village are nearby and offer hundreds of shopping options. And, Sunbird is within a half-hour drive to both Sky Harbor International and Mesa Gateway Regional Airports. Enjoy resort amenities in the 43,000 square-foot recreation center that serves as the hub for all activities. In addition to the restaurant and bar, the Sunbird lifestyle offers many activities from billiards to events in the grand ballroom. Take up a new skill in one of the hobby studios or computer lab. Or, just relax and read a good book poolside overlooking the golf course. Golf on the 18-hole Gary Panks designed-course that winds throughout the community. Golfers love the less strenuous game on this 4,350 yard par-66 course. Additionally, you will find tennis courts, shuffleboard courts and horseshoe pits. 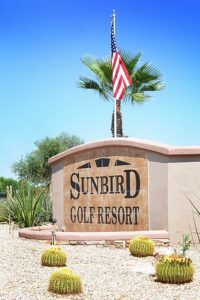 There is truly something for everyone in this Sunbird Community. What’s for Sale in Sunbird? Sunbird AZ real estate is available now, but don’t wait too long. Inventory is low, and buyer demand is strong. Ready to buy Sunbird AZ real estate? Contact us here or call 480-440-0849. Or, sign up for new listing alerts here so you can see immediately when something new comes on the market.